Time to finish your Gecho! 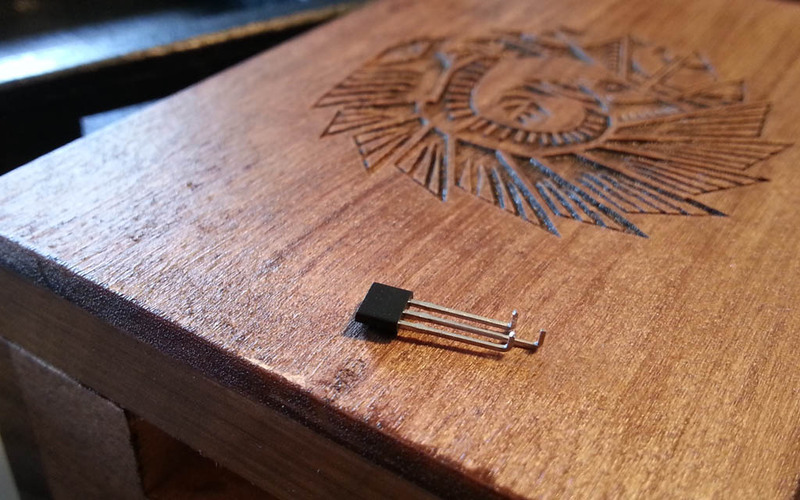 If you received some version of the DIY kit, there is a few things to do, before you can enjoy the music. In the parcel you should have received three black 3.5mm Jack connectors, those are for headphones outputs and pickups input. There is also a magnetic sensor (has 3 leads, looks like a transistor), two microphones, and in case your kit is of "Adept" version, a CH340G chip. The chip comes wrapped in polymeric foam - or you may have received the piece of foam separately, in either case - don't throw it away, this foam is good to put under the board, to give it a soft surface to be pressed against. It should span between both mounting holes, and will be held in place by screws and irregularities / components at the underside. Two bronze-finish self tapping screws are included. Depending on your selected powering scheme you might also receive one or two battery holders of AA or AAA type or contacts for 18650 Li-Ion rechargeable cell and charging module, installation of which is described in detail here. 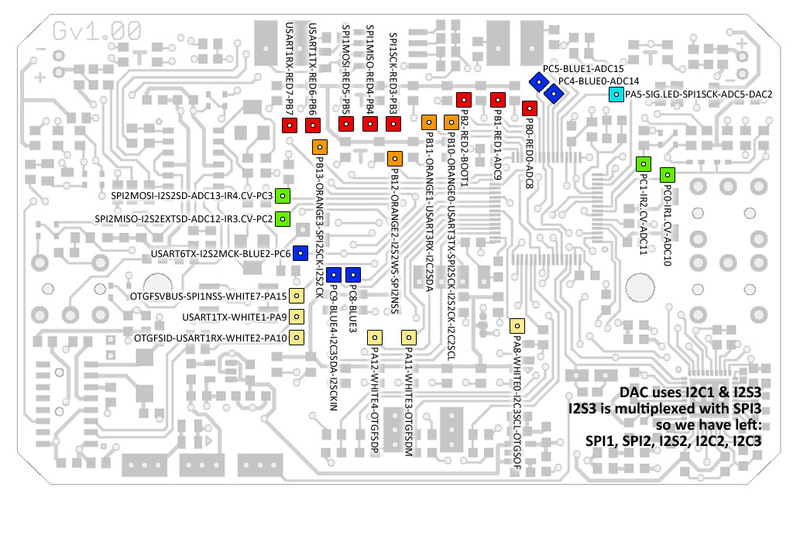 Position of THT elements you need to add, plus wiring for batteries, looks like this. The picture displays bottom side of the board but shows top side mounted components too. Jack connectors and microphones are mounted on top side, magnetic sensor and USB driver CH340G on bottom side. Please note that the holes in square or rectangular pads (magnetic sensor, battery wires, midi signals) are only vias and not meant to be used in a through-hole mounting style. Wires or leads protruding to the other side won't look good, also never try to enlarge these holes, you will break delicate connections with top or inner layers. A wire or lead is meant to be pressed against the pad and soldered on top of it. Ideally solder them sideways, as shown below, so they do not extend beyond the edge, and can completely hide under the board. Take care when mounting microphones, as their polarity is critical. Plus and minus mark is present on the board, and plus mark is usually present on a microphone too. If not, you can rely on eccentricity of the leads and place them in a such way that they end up farther from board's edge. Be sure that the Jack connectors are pressed against the board well so they sit on it tightly and without a gap, otherwise it won't look good. Magnetic sensor pads are close together. I thought it would look awkward if they were mounted in a THT style, protruding to the other side, so the idea here is to solder them on the pads in a loose way (i.e. 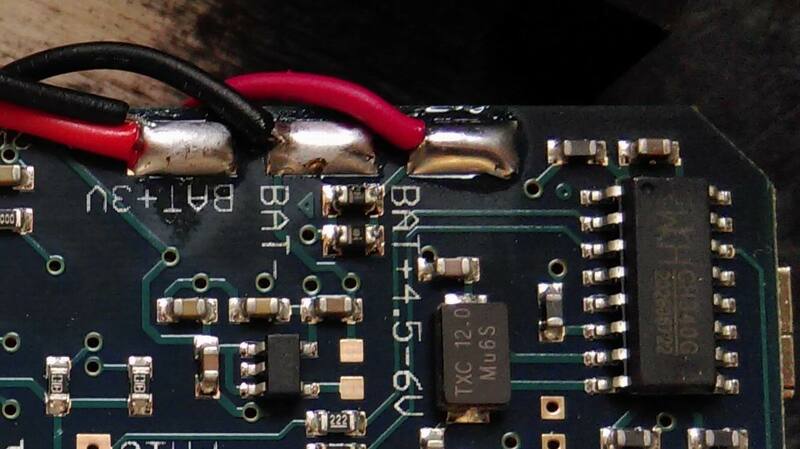 press the lead against the pad and solder it). Make sure to either bend the tip of every lead slightly (so there is no chance of short circuit from the middle lead to other two lead's pads, 1mm will do), or use some insulating material - e.g. heat shrink tube. Also, it is good to shorten them by approximately 5mm first. When bending, make sure the direction is away from "front" side of the element (the one where the marking text is). After soldering everything, you should get something like this. The board shown here has also the MIDI extension installed, please follow this guide to learn how to add it. Note how thanks to shortening of the magnetic sensor's leads, it got positioned roughly in the centre of the board. It does not need to be exactly in the centre, plus minus few millimetres don't really matter. And if you forgot to shorten them, it will work fine (it's not worth reworking and risking damaging something). Soldering this IC is a bit tricky as the board already has some solder on the pads, and those bumps make it hard to position the chip properly. If you use hot air, then you will be able to figure out the best way, but it is probably easier to do with the soldering iron. You can start with one leg, solder it in place so the rest of the chip does not move around. 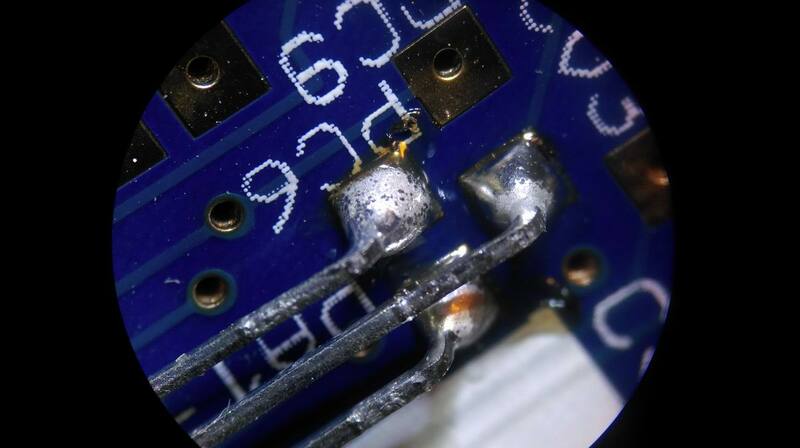 Just do a quick rough solder, you'll fix it later. 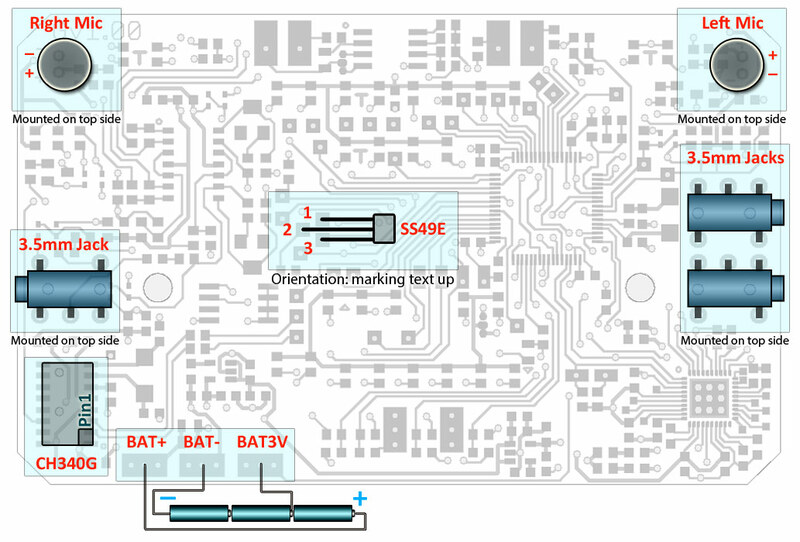 Double check the orientation of the chip while it is easy to remove it. Then you can do the same at the opposite side, to make sure the chip is aligned well... or just go on with the next leg. Hold the chip down with your finger so it is as close to the board as possible. A short video illustrates how to do this (the music is one of the pre-programmed patterns from Korg Volca Keys, slightly processed with Gecho). 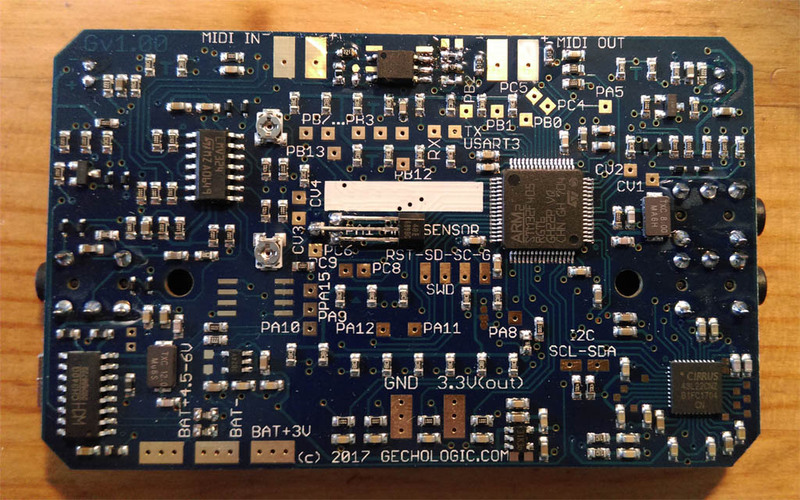 Should you want to wander further within your DIY efforts, here is a quick description of solderable pads that let you use various interfaces and signals from MCU. Most of them are occupied by LEDs but those are not really in the way, apart from acting like a pull-down or pull-up resistors, so please take this into consideration. First two rows of LEDs (red and orange) are driven by active high logic, therefore wired in a common-cathode way, the rest (blue and white) are driven with active low, so wired as a common-anode. For easy reference, colour of pads in following picture equals colour of LEDs, and the four CV pads (wired to IR distance sensors, but possible to safely override with external voltage in 0 to 3.3V range) are shown in green. Got our box as well? Here you can get some ideas about how to put everything together. I received the Gecko last week. Thanks. I soldered the three jack connectors without any problem. I have a problem with the magnetic sensor. Is it mounted on top side ? I see well where to mount the sensor in the three holes of the board. Can you send a photo to illustrate the position of the sensor ? Good idea, one picture is worth a thousand words - I've added a photo so there is no doubt about the placement and orientation.